VMI Football will begin 2017 spring practice on Thursday, April 6 and will hold drills throughout the month of April. Third-year head coach Scott Wachenheim and his team will conduct three straight practices April 6-8 before working a regular practice slate over the next three weeks. Scrimmages are now scheduled for April 14, 22, and 29. The April 22 scrimmage start has now been moved to 9 am. Wachenheim will have several key priorities on his spring practice “to-do” list – among them starting the process to find a replacement for VMI all-time leading passer quarterback Al Cobb who is graduating this spring. Developing the running game and continuing an improved defensive performance are also areas of emphasis. The defense allowed 7.3 points per game fewer in 2016 from the previous year and also allowed the second fewest points in a season since 1988. 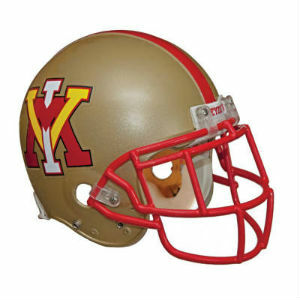 VMI returns seven defensive starters from its improved defensive unit including starting inside linebackers Ryan Francis (96 tackles-13.5 TFL) and Allen Cratsenberg (126 tackles-8.5 TFL) along with three-year starting safety Greg Sanders (68 tackles 2 interceptions). The Keydets, 3-8 last season, will be young on offense as just four starters return from 2016, but a full compliment of running backs bolster the best depth situation in that position group in years. All practices at Fiorini Field (turf practice field) except Foster Stadium scrimmages. Practice schedule and location subject to change.